John Gillespie grew up on a farm near Appleton, Wisconsin, and attended a one-room rural school. When John was in second grade, a family moved into the area and their daughter, Jan, a third-grader, started attending the school. They became best friends and have been married for 60 years. They raised two sons of their own, Steve and Tim, and have three grandchildren and two great-grandchildren. 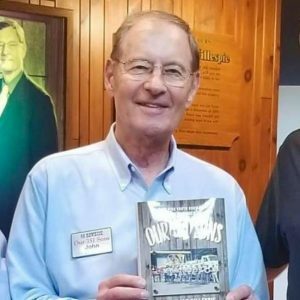 In 1965, a few years after taking in Jerry Monson, a 13-year old foster boy from an unfortunate family situation into their home, John and Jan founded the non-profit Rawhide Boys Ranch. The following year they enlisted Bart Starr, of Green Bay Packer fame, and his wife, Cherry, to partner with them. With their support, Rawhide became one of the most successful residential programs in the nation for teenage boys placed by juvenile courts. John and Jan personally had 351 teenagers live with them, about ten at a time, for one to three years each, in addition to their two sons. So the book was named appropriately, Our 351 Sons. When the Gillespies stepped down in 2000, the ranch had a full-time staff of 145 men and women working with 200 young men each year, plus managing the largest vehicle donation program in the nation. Rawhide was founded in 1965 by John and Jan Gillespie with the help of NFL Hall of Fame Legend Bart Starr and his wife Cherry.